Utah's State Championship series on Wednesday in Salt Lake City represented a key shift in the season, and signaled the unofficial beginning of the nationwide postseason. What we ultimately learn from results in Utah could in some ways shape how we determine the landscape in the coming weeks. So get ready for things to get crazy. But first, we need to dive into the national storylines of our first big state championship meet at Sugar House Park. Here are the major notes to take away from the competition. 1. The Desert Hills girls got the state title they were training for all season. The No. 11 ranked squad picked up 55 points, beating second-place Pine View by 23 points (78) en route to a killer compression of 52 seconds and an overall average of 18:57 for three miles. The NXR Southwest Region will be an especially tough bracket this year, with a few Colorado teams boosting the overall depth of field, but Desert Hills should be a team worth watching at that level. All five of the Thunder's runners who scored at the state meet are seniors, and the pair of Bailey Brinkerhoff (18:26:40) and Samantha Nelson (18:31.10) went back-to-back in fifth and sixth place, respectively. 2. In the Class 6A race, it clearly wasn't the Lone Peak girls' best day. Without sophomore Eliza Arrington, who finished sixth in this race last year, the No. 5 Knights were at an even bigger disadvantage against a hungry American Fork team that lost to Lone Peak just 13 days prior at the Region 4 Championships. 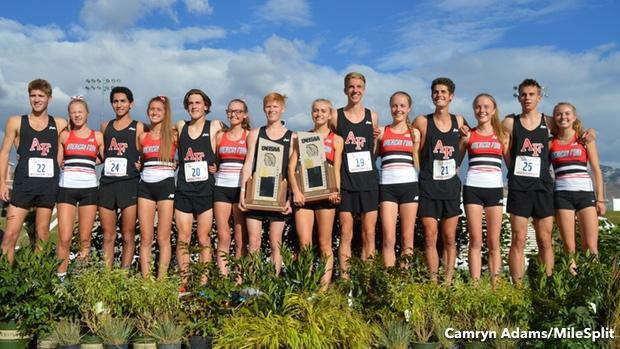 But this time, American Fork was absolutely dominant, finishing its top two runners in the top 13 places and its 3-4-5 in 16th, 17th and 18th place, respectively, scoring a winning mark of 73 points. American Fork had a remarkable 11-second spread, essentially stealing the title away from Lone Peak's grip. The Knights saw sophomore Reagan Gardner finish third overall in 18:22.30, but there wasn't much the Knights could do against superb displacement and while also missing one of its key runners. After finishing third as a team last year, Lone Peak was runner-up this time around. 3. Grant Gardner got his title. It wasn't his fastest race, and it probably wasn't even his best of 2018, but the Springville senior got the job done. He took the Class 5A crown in 15:26.80, running away from Corner Canyon's Mark Boyle by six seconds. It was the first individual cross country championship for a Springville boy in the program's history. Finally got Springville boys an individual XC champ!!! 4. Beyond Gardner's performance, however, was another upset in the Class 5A race. Corner Canyon's boys, which looked phenomenal in its Region 7 Championships on October 5--the squad put down a 38-second spread and 15:32 average--downed No. 21 Skyridge by 12 points (47-59) to earn the boys title. This team was sixth last year, well behind most other teams returning talent in their classification. But there was something about this squad. Boyle was second overall in 15:32.70, while its next two runners closed in the top 10 and its fourth and fifth were in the top 16. Ultimately, the win came down to average. Corner Canyon's and Skyridge's spread was almost identical--40 to 42 seconds--though the former sported a 15:58 average overall. Skyridge was displaced late in the race and its fifth finished 24th in 16:25.70. 5. 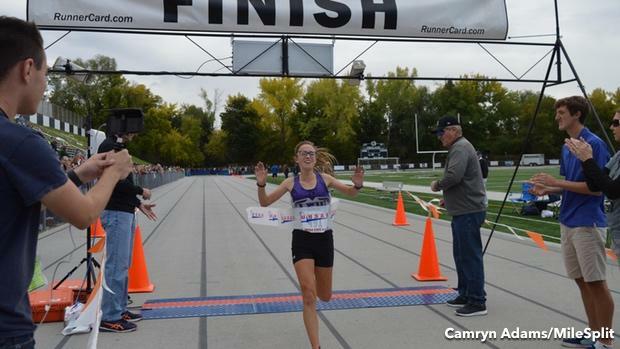 Lehi's Anna Martin is one of the best runners in the country. The junior recorded a state record on Wednesday at Sugar House Park, posting a 3-mile best of 17:15.00 at 4,226 feet of elevation. That time roughly converts to 17-flat at sea level for 3-miles based on time conversions and roughly 17:36 for 5K. She was head and shoulders ahead of the Class 4A field, beating second-place Helena Miyazawa of Mountain View by 33 seconds. The previous state record at the course was set in 2015 by Courtney Wayment, who ran 17:24.70. 6. And then there was American Fork's boys. The Class 6A race was probably a little closer than the No. 6 Cavemen envisioned, but there was a legitimate reason for that. Senior Carson Clinger ended up being disqualified after an official ruled that the senior was a bit too physical at the line and impeded a runner. What was likely a third-place finish by Clinger meant that the Cavemen were forced to dig into the well to find its fifth, and senior Aaron Steed performed admirably, finishing 31st in 16:19.10. American Fork still dispatched Davis by 21 points, winning the Class 6A title with 72 points. How about that depth? But championship teams find ways to win, and American Fork certainly did that.